Native trees, plants, roots and soil make it possible for life to happen on Earth. TELUS is helping organizations like WWF-Canada and Carolinian Canada protect biodiversity through native plant gardening projects that use technology and good old-fashioned botany to restore wildlife habitat, curb climate change and make our local environments more resilient. If you are interested in beginning a garden or adding native plants to an existing ecological space with more species and features, we are great collaborators to assist you. We add our ecological and technical expertise to assist local landscapers create more ecologically beneficial nature creations in the city. We also have worked directly with landowners. Specifically, we assist in design, plant sourcing and 'biodiversity building.' To get site specific quotes, recommendations, contact us. 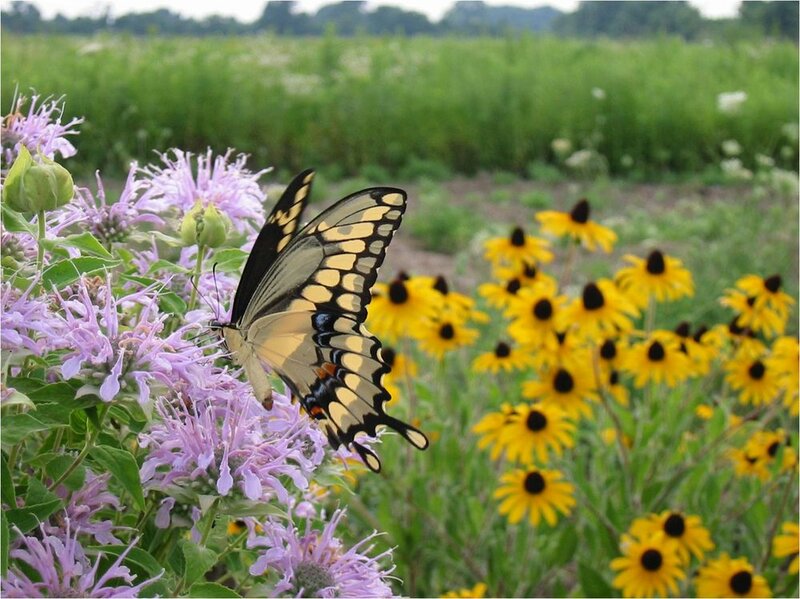 To register your property as a part of a national program for native plant gardening, visit In the Zone Gardens, a project of Carolinian Canada and World Wildlife Fund Canada. If you have a rural property within the Carolinian Zone in Canada (see Map), you may be interested in signing up for Carolinian Canada's Landowner Leaders Program, an initiative that will assist you in visioning, conservation planning and possibly find some funding sources to conduct conservation restoration on your property. Below are some logos of the programs mentioned above. Further below are some gardening options for you if you would like assistance with urban properties. Stage one of an urban wetland system. The final creation included two ponds, a 1.5m waterfall, a spillway, and a marsh filter (native wetland, meadow plants). The size required is about two to three car parking spaces. London, ON, Canada. Few features in a landscape attract more wildlife or create more visual beauty than wetlands. Further, the sounds can soothe while drawing in migrating songbirds in spring (they migrate at night and you wake up to them drinking, and feeding in the morning). The calls of toads or frogs that may choose to breed in urban wetlands are refreshing sounds often softening the harshness of planes flying over head, or the traffic on nearby roadways. Once established, wetland plants add much colour and texture, providing landing pad for dragonflies, butterflies and other beneficial insects. Ah, yes, the Red Trillium. Some call it the Wake Robin as it's blooming coincides with the return of Robins in great numbers. This plant often takes nearly ten year to mature before it flowers. Occasionally living in excess of 30 years, spending time with a clump of these plants growing in the city gives me so much hope for the return of woodlands back into our urban areas. There's nothing like a diverse forest of northeastern North America. Sure, that's my bias as these temperate forests are my stomping grounds, my Alma mater, my sacred grounds. While it's not easy since many urban areas have been so denuded of nature and nature's soul (fertile, alive, and diverse soil), we have a pretty good idea how to build back forests in our front, back or side yards. Our lawns can go from a few species of non-native grasses and 'weeds' to dozens of species of ferns, trilliums, ephemeral spring flowers as well as gorgeous native grasses, long banished to the outskirts of town. Have a look in the photo gallery below for the transformation of our yard using a number of shade species from the eastern woodlands. Giant Swallowtail on a Wild Bergamot Flower with Orange Coneflower in the background. Prairies and meadows are magical places, painting nature's palette with all the colours of the rainbow. Native grasses of the prairie and meadow are beautiful in their own right in addition to being hugely important in sequestering carbon and providing the backbone for our open grassland ecosystems. That said, there's much more to the prairie than grasses. The myriad of colours represented by our native flowers of prairies and meadows is exhilarating. What's wonderful about these ecosystems is that these beautiful grasses and wildflowers attract many pollinating insects which are crucial for biodiversity. Since many new homes have much sunlight, this habitat could be spread across eastern North America on small parcels in cities and suburbs. An ecologist and landscape designer (by hobby), I have designed many prairie, woodland and wetland landscapes. My own property in Wortley Village, The Forest City, Ontario, Canada has elements of all ecosystems, including an elaborate wetland (also featured in photos below). Yes, at times, I eat, sleep and speak native plants. Photo courtesy Mike Lynch. Native Plants are featured front and centre at our home in Wortley Village, The Forest City, Ontario, Canada. Still leaving enough grass and open areas in which to play and entertain, our backyard is lined on the edges and in the far back with native plant gardens. A backyard wetland system (this photo shows final stages before completion) was created in our yard, featuring two ponds (one deep with fish, the other shallow for dragonflies), a main waterfall, a spillway and 'marsh filter' were installed. The wildlife stampeded back filling our lives with lots to watch and many amazing stories to retell. Later when the backyard pond matured...the native plants at the edges brought in a much more natural appearance and of course many more insects, amphibians, reptiles, birds and mammals. The show stopper: Large Yellow Ladyslipper. Quite a rare species in the urban garden but I have found they hold their own, even growing close to a busy road. With a little sun, water and adjacent habitat, a number of skimmer (dragonflies) species will frequent your yard (this one is a southern species). The mighty acorn. Oaks are crucial for maintaining and growing biodiversity in our ecosystems. Not grown very well in nurseries, sometimes they are hard to find. They grow really well from acorns. Why not grow some of your own? Wild Leek: a great forest plant of early spring and later it flowers once the leaves disappear. Over harvested for its flavour, this species taken seven years to mature and should be respected for its place in wild forests (don't pick it!). The canopy under the canopy! Native Mayapple plants (about 25cm or 1 foot tall) grow under the canopy of a Honey Locust in our yard. Asters in the fall in our front garden. A small native fruit bearing tree, the Paw Paw in our backyard. The flower is featured here. The fruit is pear-shaped and tastes like a mixture of mango, pear and custard. A forest edge/meadow species, the Michigan Lily will tolerate a fair amount of shade. These two are growing beside the front steps of our home. Every yard in the city should have a few dozen of these early spring beauties; Blood Root - the staple plant of the shaded eastern woodland. A phenomenal benefit of having many oak trees around - insects!!! This walking stick is a male who lived in the leaf litter until mid November.